On this blog, I often mention Araku but using the keitai limits the length of the posts. Here is a longer review of the bar that I wrote for the Australia Society newsletter and also some photos of the recent renovations. Shinjuku’s Golden Gai bar district evokes post-war Tokyo. Nestled in a series of narrow alleys between the Shinjuku ward office and Hanazono Shrine, Golden Gai is home to over 250 tiny bars – some with only enough seating for 4-6 people. 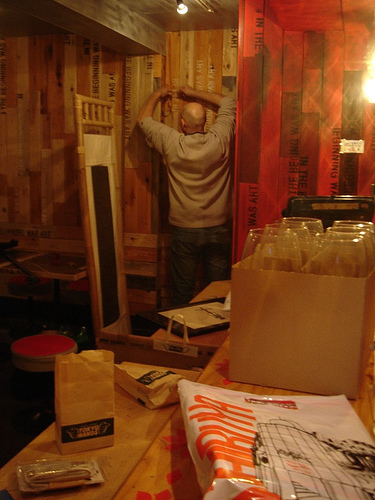 To the uninitiated it can be a confusing maze of bottle-keep, handwritten Japanese menus and unspoken bar etiquette. So what is it like to go drinking in this area that is foreign even to many local Japanese folk? 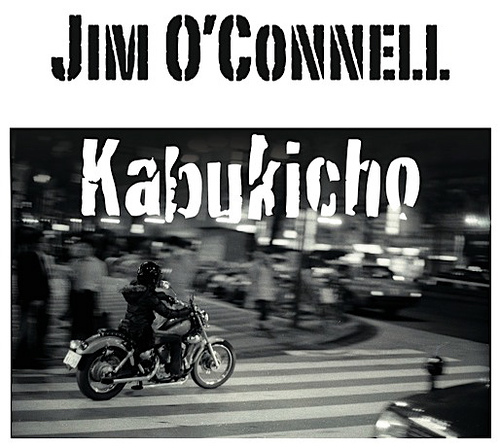 Quaint, mysterious and gritty are certainly words that spring to mind. The buildings themselves were knocked up during the US occupation after WW2 and not much has changed on the outside since then. 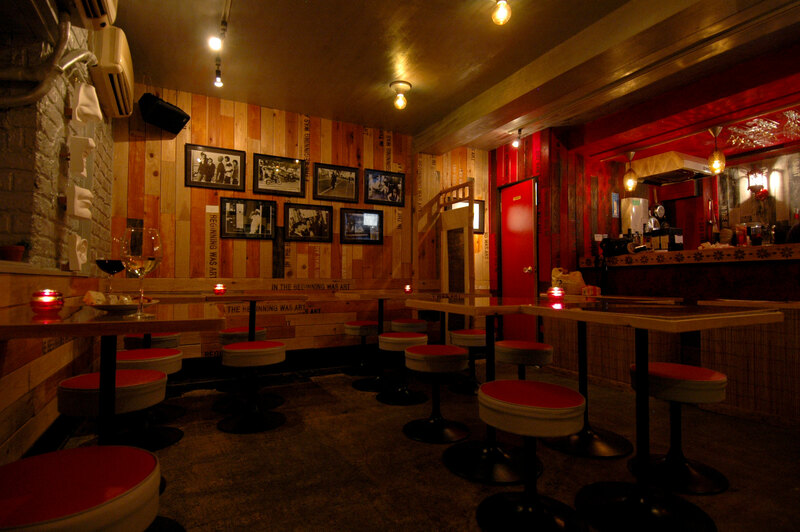 Originally the occupants were touting for favours of the libidinous kind, however, those seedy red-light days are long gone and now Golden Gai is famous for bars of every other kind of passion – photography, literature, whisky, existentialism, politics, art, cinema, music – punk, jazz, folk, country…. You name it, there is a bar where there are experts quietly discussing it. Araku’s extensive, bilingual drinks menu features Australian wines by the glass or bottle, Japanese shochu, and the usual options of mixed cocktails, beers and shots. The wine list, while not huge, offers good value Australian wine by the glass or by the bottle. Brands such as Dreamtime and Peter Lehman are currently featured but these do change seasonally. Only Australian wine is served and the tasting notes are bilingual. 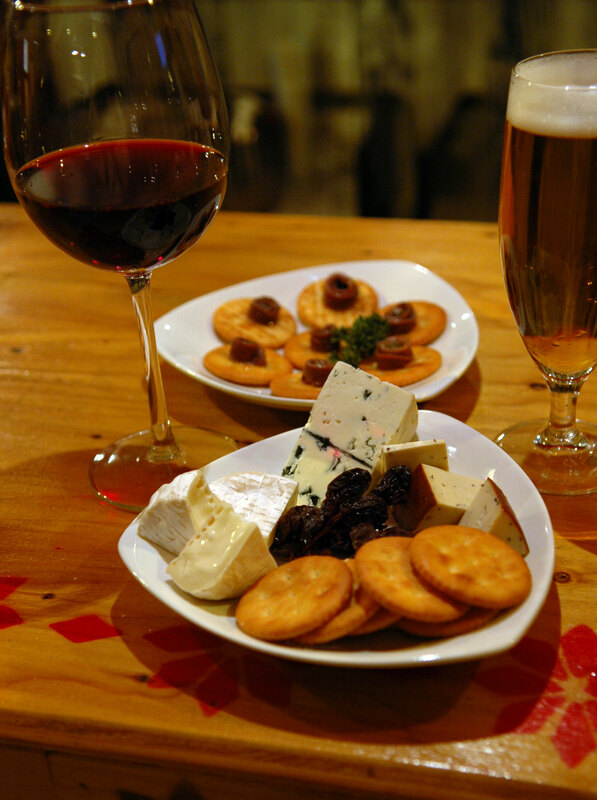 If you like a bit of cheese with your wine, a cheese plate is available for ¥900. Other snacks and nibbles are available, but don’t expect a full meal. Golden Gai bars all operate a tab system that is calculated at the end rather than on a per drink basis so it is good to know in advance what you will be in for. It is customary for each bar to levy a cover charge (between ¥800 – 1,000) for which you will receive a small snack, hand towel etc. Then you can either drink from a previously purchased bottle that is kept just for you (bottle-keep) or order from the bar. If you visit a few bars regularly, this system is convenient and economical. Araku’s cover charge is ¥800 and drinks are around ¥600 including draft beer. All the prices are clearly outlined in the menu, so there are no surprises. Araku opens at 8pm and the party continues until the last customer leaves - usually 5am but sometimes much later. Araku provides free wireless Internet, and mobile phone chargers are also available for all standard flavours of Japanese mobile phones. The music is all operated via a new iMAC and the playlist depends on the tastes of customers in the bar. You can request Australian music, jazz, electronica, J-pop, etc., from the extensive music library. Best way to find Araku is to head for the Shinjuku ward office near Mr. Donut on Yasukuni-dori – the street with all the neon signage (very Ridley Scott). 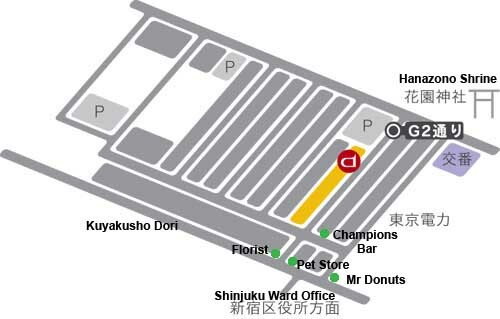 Opposite the ward office on Kuyakusho-dori, turn down a small street with a pet store and florist on the corners and at the T-junction is a bar called “Champions” – a Filipino-run Karaoke bar. This marks the start of Golden Gai. Take the small street to the left as you are facing Champions and Araku is around 50m straight ahead on your left hand side. 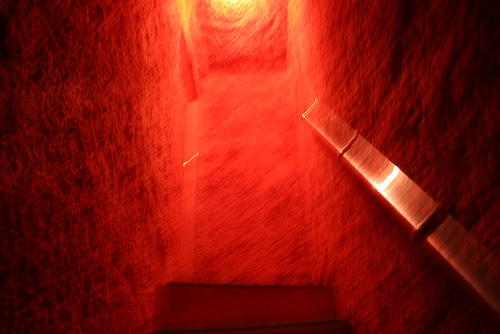 Look for the red Araku sign and head up the red-carpeted staircase above a bar called 10CC. 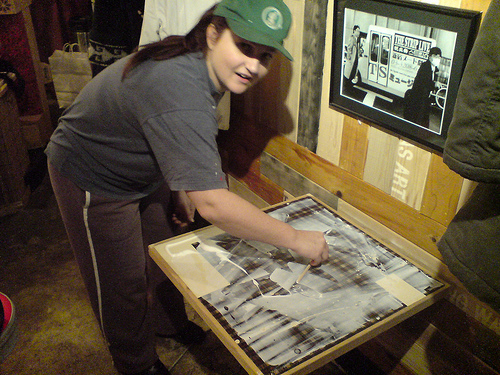 Me getting sticky covering the tabletops. The Ashman working with tools!! I love it when he is all handyman!! Goodness, its HUGE by Golden Gai standards! Oh, i wish i could go there! It looks awesome, I cant wait to visit! Such an evocative description. It makes for great reading and encourages exploration of the area. 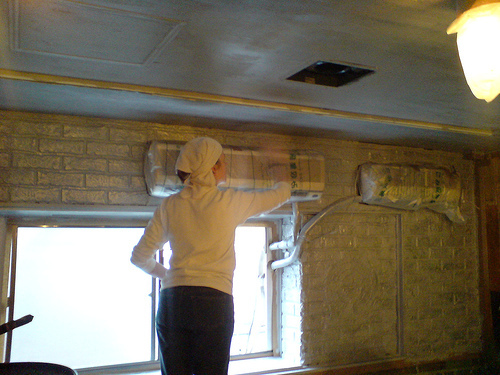 The before and after pictures of the renovation job will be great for a reminisce in the future. My best friend and I will be dropping in to see you April 2009. I just came back from this year’s trip (just discovered Golden Gai—Didn;t have time to go back I’m afraid). It looks awesome. One more place that’s worth visiting.